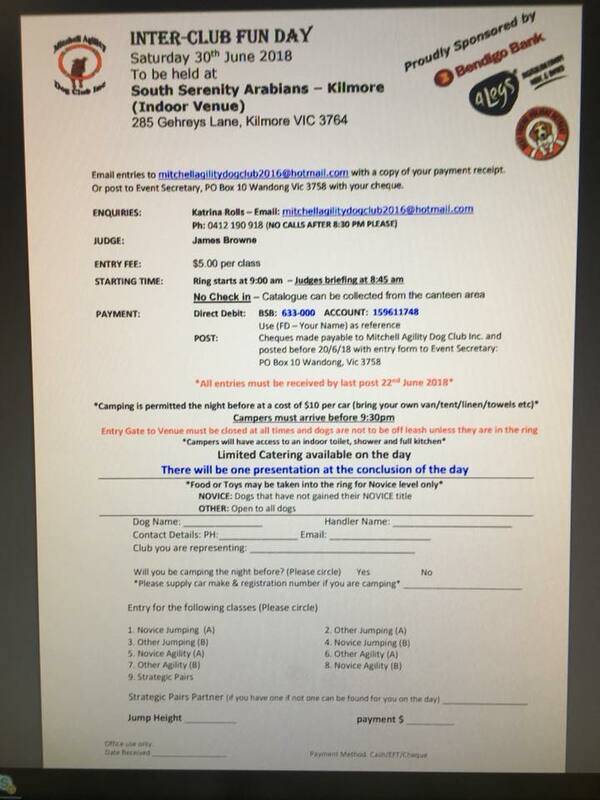 New date for K9 Agility Club in lieu of Feb Twilight. Double Agility Games Trial - KCC Park. Not being held on this weekend. Moved to Saturday 23rd March 2019. For this year only. Future trials to be in October. Schedule updated 12 noon 15 Sep to correct the class codes of Nov Agility E, and Nov Jumping F. The Events have not been changed, only the codes. Note: Originally scheduled for Sunday 16 Sept but ground now unavailable on that day. Barmera is 160km west of Mildura, near Renmark & Berri. Saturday 16/06/18 SCOTTISH BREEDS DC Inc (KCC) Assume not being held. Note Extended Closing Date to Fri 27 Apr. 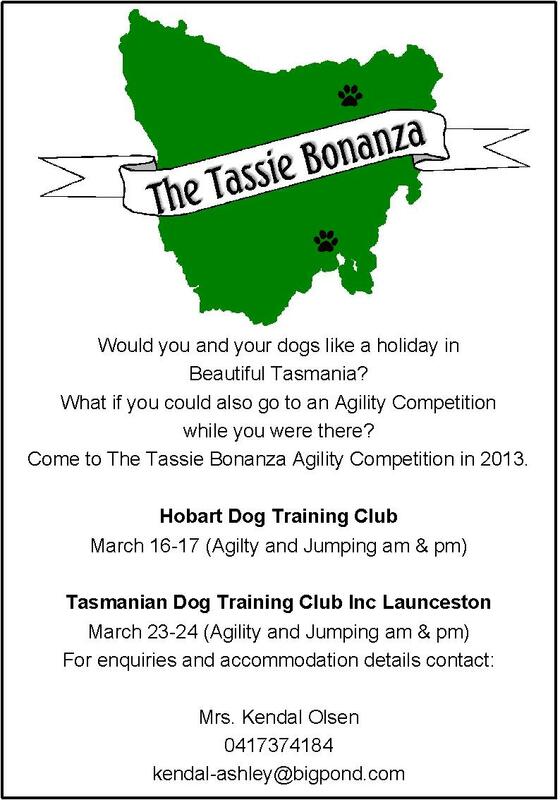 (Fri 16 Mar 18) Open Agility, Jumping & Obedience/Rally 3 Day Easter Trial. Games on Monday AM, Strategic Pairs & Snooker. Schedule updated 11.30 am Monday 15th Jan. Updated schedule includes reference to interstate BC Club members re being eligible for BC Club 'Prizes'. 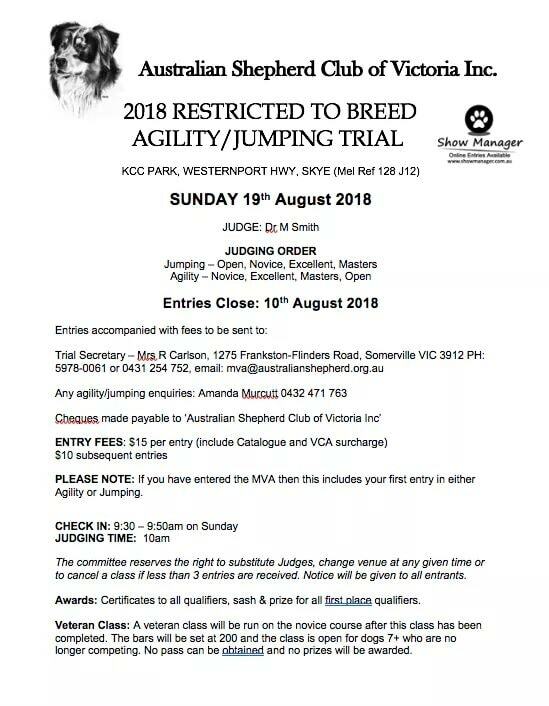 Agility, Jumping & Games Trial. Updated to advise Action Dogs members how to claim discount. Saturday 09/12/17 BULLA AD Not being held. BAD has relinquished the Dec trial date. Sunday 26/03/17 ALBURY & BKC (Extended to 10/03/17 ). Sunday 04/10/15 BERWICK ODC (23/09/15) Height based trial (no Top Dog Points) Online entries open. Heats 3 and 4 - Followed by a Fun Run. Heats 1 and 2 - Followed by a Fun Run. Bemboka is approx. 600 km from Melbourne and 7.5 hours travelling time. It is 320 km (and 4 hrs) past Bairnsdale. Sunday 29/04/12 VIC TEAM FOR 2012 NATIONALS - Selection Trials - Heats 3 & 4 of 4. Saturday 17/03/12 VIC TEAM FOR 2012 NATIONALS - Selection Trials - Heats 1 & 2 of 4. Bemboka is approx. 600 km from Melbourne and 7.5 hours travelling time. It is 320 km (and 4 hrs) past Bairnsdale. Closes 08/03/12. Saturday 12/11/11 K9 AGILITY - Open Agility/Jumping/Games Trial at KCC Park.